One of the oldest running art shows in Kansas is Russell’s Original Art Review started in 1969. The Russell Lions Club needed a project that would not duplicate or conflict with other clubs and their projects. Beverly Caldwell, a young artist of distinct talent, suggested that the Lions club sponsor an art show. Lewis Clancy along with Lions president elect Rev. Roy Harrington of the First Baptist Church set out to get the project underway. They also sought the professional help of Trudy Furney, Art Priddy, Derril Castor, and Sherry Brungardt, members of the Russell Public Schools art faculty. In a contest 121 name suggestions were made by 43 entrants. Beverly Caldwell was the winner with the name of “Russell’s Original Art Review” with ROAR for the Lion Backers and a sketch by Caldwell of a lion with its mouth open. The Art Club from the high school was ever helpful with hand lettering of ribbons, posters, and labels. They also aided with setting up the show itself and assisting during the show. There were 94 artists that had entered 264 paintings. The media classes were oil, acrylic and watercolor, and acrylic in watercolor technique. There were 14 awards given totaling $1,200. The Show was held at the Russell 4-H Building. Since that time ROAR has changed in many ways and yet stayed the same. The Show is still held at the Russell 4-H Building for three consecutive days, but we now have 8 different categories for artists to participate in: oil, watercolor, other two-dimension, sculpture, pastels, photography, computer generated and ceramics. ROAR gives out over $3,600 in prize money at the discretion of the judge. 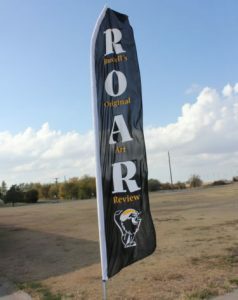 In 2009 ROAR was contacted by Clarence Crawford’s children, Candy and Kent, to come up with guidelines and a name to be given in honor of their father and all the hard work he had contributed to the ROAR Show itself. Since then the Crawford-ROAR Award has been given to an artists that has entered in the juried portion of the ROAR Show. Funding is provided each year by Candy and Kent Crawford. Also in 2009 another special award was given out and it was the Trudy Furney Tribute Award, in recognition for all of her contributions to the art department and the art world itself. In addition to those two awards ROAR also gives out the Art Priddy Remembrance Award. Art Priddy was an elementary art teacher in Russell and one of the key persons who played an important role, along with art teachers Trudy Furney, Derril Castor and Laureen Farrell, in getting the first ROAR Show started. One of many projects done by ROAR was the Trudy Furney Sculpture. 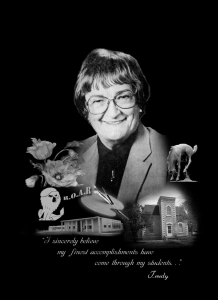 To pay tribute to Trudy Furney and her many accomplishments ROAR honored her with a sculpture piece located on the Russell High School grounds. This sculpture serves as a tribute to Trudy whose teaching and support of art benefited hundreds of students and positively impacted the lives of many other Russell community members and friends. Her many accomplishments are etched on the back of the sculpture piece. The sculpture was completed in October of 2010. ROAR would like to thank the community for their continued support in promoting and financing the ROAR Art Show and the various art projects undertaken by ROAR. Without the support of the Russell Community we would not be able to continue promoting the arts in Kansas.